Israeli soldiers abducted, overnight until early morning hours Sunday, eighteen Palestinians from several parts of the occupied West Bank, during extensive and violent military invasions and searches of homes. The Israeli army said a homemade explosive was also hurled at Beit El military base, near Ramallah, in central West Bank, before the soldiers invaded the nearby al-Jalazoun refugee camp, and conducted searches of many homes. 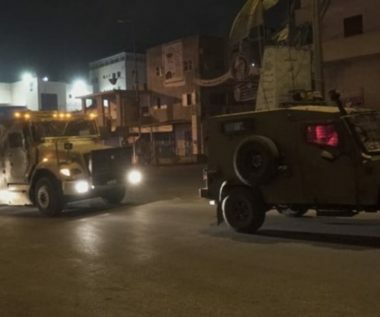 In addition, the soldiers invaded many homes in Doura town, south of the southern West Bank city of Hebron, and Tarqoumia town, west of the city, before storming and ransacking many homed and abducted six Palestinians, including several political prisoners. In occupied Jerusalem, the soldiers abducted a Palestinian, who remained unidentified at the time of this report, in the Al-Aqsa Mosque, and took him to nearby interrogation facility. Furthermore, the soldiers issued orders to four employees of the Department of Waqf and Islamic Endowment, preventing them to from entering the Al-Aqsa Mosque for one week. They have been identified as Mohammad Dabbagh, Raed Zghayyar, Husam Seder and Mahdi al-Abbassi. Also in Jerusalem, the soldiers abducted the Secretary of Fateh Movement in the al-‘Isawiya town, Yasser Darwish, after invading and violently searching his home, causing damage. The soldiers also fired many concussion grenades and gas bombs, during protests that took place after the invasion. Qassam Riyashi, Azzoun – Qalqilia. Hamza Salim Radwan, Azzoun – Qalqilia. Raed Salim Radwan, Azzoun, Qalqilia. Qoteiba al-Beyari, Jifna – Ramallah. Ahmad Abu Sabri, al-Jalazoun refugee camp – Ramallah. Ahmad Sami Ghneim, Burqin – Jenin. Tareq Ibrahim Shadouf, Burqin – Jenin. Bassel Mohammad al-Fasfous, Doura – Hebron. Rezeq Fathi Ja’afra, Tarqoumia – Hebron. Abdullah Fathi Ja’afra, Tarqoumia – Hebron. Ramzi Walid Ja’afra, Tarqoumia – Hebron. Yasser Darwish, al-‘Isawiya – Jerusalem.